This is one of the most ancient dances of the Aymara communities of the altiplano. 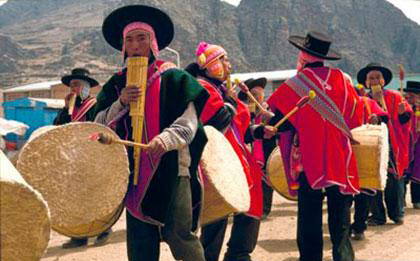 The musicians dance in circles, some of them wearing condor feathers, as they play their traditional pan pipes of varying dimensions. The music of the Aymara, “restrained, repetitive and austerely beautiful”, plays on the pentatonic scale and reminds strongly of the most ancient ritual music of the Far East. Recorded by Louis Girault in 1955. First published in the Audivis-UNESCO collection “Panpipes: Syrinx de Bolivie”, 1987. Reproduced here by courtesy of Mr Vincent Morley.